AGAIN ?CLOSER ?/font> came the awesome full-throated roar of a hunting lion. Rrrrrooooom, oooom, oooom, uh, uh, uh! More than anything else, this savage sound epitomizes wild Africa. “It always raises the hackles on my neck,?Elgin said, “and starts the adrenalin tingling through my body. ?nbsp; Only male lions roar, and the deep, frightful violence of this one's roar bespoke a monster lion. The three hunters ?American Elgin Gates, professional hunter Jack Blacklaws, and Mbui, their wizened little Kaffir guide ?were sitting at the base of a giant, grotesque-limbed baobab tree where they had set up a meager camp an hour earlier. In the shadowy twilight, Blacklaws had poured the first long-deferred drink. The sharp bite of the warm Scotch and the pungent flavor of their Manila corona cigars were a fitting climax to a long and weary day. Mbui had led Blacklaws and Gates far across the sandy, ochre veldt and through tangled thickets of thorn, mopani, and miombo, to that remote water hole along the southern fringe of South Africa's vast Kalahari Desert. They had sat there in relaxed contentment while the roseate afterglow of sunset slowly darkened to crimson. Flights of imperial sand grouse, silhouetted against the blood-streaked sky, came whispering in out of the desert to drink at the waterhole before the night creatures took it over. As the first jewel stars appeared in the darkening sky, Mbui kindled a tiny fire and squatted beside it to roll a cigarette with strong Kaffir tobacco and a bit of old newspaper that he'd found behind the front seat of the Land Rover. As he drew a glowing coal from the fire and raised it to light his cigarette, the first guttural roar shattered the stillness. Although it was a distant roar, the ground vibrated with it. Mbui dropped his light and hunched closer to the fire. He clutched his unlit cigarette and rolled his eyes in fear. Blacklaws and Gates grinned at each other ?partly because of Mbui's behavior but mainly because neither of them had believed that there was really any truth to the story of the giant black-maned lions of Korannaland. The story that Gates had pieced together over several years had begun with a footnote in a scientific journal. Gradually, he had also gathered rumors, bits of information sifted from conversations with a variety of people in South Africa, and ?finally ?a first-hand account related to him by an eighty-six-year-old Boer hunter who had been to the area as a young man in 1892. Gates had nothing really solid or recent, but enough to lure him across two thousand miles of Africa to this primitive, unknown corner of the Kalahari. The third roar came out of the night ?still closer but farther to the east. “I suspect he's smelled us and the fire,?Blacklaws said, “and is circling the camp to investigate.? Lions behaved basically the same in most areas of Africa where Gates had had experience with them, but he was now in a new and different corner of Africa, and this lion was of a different breed. “I think we'd better build a boma, just in case,?he said, voicing the thought in both his own and Blacklaws’s minds. With Mbui's eager help, Gates and Blacklaws built a twenty-foot ring of fires and dragged into the circle enough fuel to last all night. Then, while Mbui cut thorn bush with his panga by the light of the fires, they pulled the thorn high around the ring in a classic boma, the Africans' age-old thorn “fence?as night protection against marauding lions. While they worked, the lion had circled the camp, roaring at intervals. Another lion answered in the distance. Later, when the hunters lay on their blankets in the center of the boma, Blacklaws pointed to Mbui. Though he was still trembling with fear, he had finally summoned up enough courage to light his cigarette. Moving from fire to fire, he squatted and carefully fed each one. “We won't have to worry about tending the fires tonight,?Blacklaws said. “Mbui will take care of that.? About midnight, the lions moved off until they could no longer hear their roars. Reassured, Mbui dozed off. Gates lay awake, thinking of lions, while the fires died down to ruby embers and the gleaming panoply of stars pressed down into the twisted limbs of the baobab. Lions ?through myth, legend, and history, man has feared and worshiped these great carnivorous cats since the beginnings of civilization. The ancient Egyptians and Persians deified them. The Greeks sculptured them as royal symbols. The Romans pitted them against gladiators. To this day, we respect them as a fearless living symbol of Africa. A fully grown male lion weighs up to five hundred pounds. For its size, it's the deadliest adversary in Africa. For a hundred yards, a lion can outrun a race horse. One bite of those powerful jaws can crush a man's skull as easily as you can crush an egg shell. A lion can run alongside a Cape buffalo, leap on its back, thrust one huge paw forward and bury talons in its nose, and with a powerful wrench break the buffalo's neck. A wounded lion lies in heavy cover until his antagonist is close, then launches himself with a grunting roar, claws extended, teeth bared ?a terrifying spectacle. He comes in great leaps, making deadly aim with a rifle difficult or impossible. For this reason, most professional hunters prefer double-barreled shotguns for close-quarter encounters ?the idea being that the shot pattern covers a greater area than a rifle bullet covers. Any kind of a hit in the face blinds the lion, and within fifty feet or so, a shotgun charge is even deadlier than a single bullet. If the lion reaches his victim, the carnage is terrible. Anyone who survives a lion attack is scarred, maimed, or crippled for life and may wish that he were dead. The wounds inflicted by lions' septic claws can turn into gangrene unless they're treated immediately. One swipe from a massive front paw can take off half a man's face, and when the victim is down, the cruel, crunching bites are deadly. The long canine fangs can meet anywhere in a man's body and usually do. Compared to the other four of Africa's “Big Five,?lions can display the sly cunning of the leopard, the malevolent vindictiveness of the Cape buffalo, the raw power of the raging rhinoceros, and the crafty courage of a rampaging bull elephant. For these reasons and qualities, the lion is one of the most desirable big-game trophies in the world. Most hunters may collect most of the big game in Africa, but they will never be fully satisfied until they bag a lion. Without the lion, an African safari just isn't complete. But lions aren't easy to come by. Gates knew big-game hunters who had made as many as six trips to Africa before collecting a lion. Also, within five years, three men whom he’d known as friends had been killed by lions that they had wounded and followed up. Two others, badly mauled, had survived. Gates had long held to the philosophy that there is no substitute for that first well aimed shot when you're hunting dangerous game. He'd let a trophy lion go, rather than gamble on a fast shot at a running lion or a snap shot at the rear end of a lion disappearing into heavy cover. Little known outside scientific circles is the fact that there are over a dozen recognized varieties of African lions, from the scrawny maneless bush lion of Somaliland to the black-maned giants of South Africa, presumed to be extinct. Gates had collected most of them in other parts of Africa, and the story that he had pieced together ?that some of the giant black-maned lions still existed in that lost corner ?had brought him far across Africa. For weeks, he had been chasing the end of a rainbow. Now he had found it. But a few details were still not clear yet ?like maybe these would be ordinary lions, not the legendary monsters that they were supposed to be. There was also the little matter of locating and shooting one ?never an easy task with lions. At daylight, Mbui was curled up, still fast asleep. Blacklaws motioned for Gates to be silent and imitated ?with chilling accuracy ?the roar of a lion. 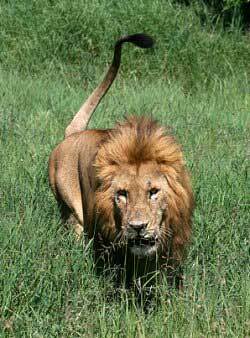 Mbui sprang up terror-stricken and looked wildly in all directions for the lion that he thought was inside the boma. “Baas,?/em> he said gravely in his stilted Afrikaans after Gates and Blacklaws had stopped laughing and assured him that there was no lion close by, “I had a vision in the night that the great lion Tau was chasing me through the vleis and kloofs, and finally I climbed to the top of a klopje and was safe. And then Tau roared behind me and leaped. ?nbsp; He paused and felt of his arms and body. “But now I am awake, Baas, and it is good to still be alive." Something about the incident stuck in Gates’s mind ?but that morning, he couldn't pin down what it was. Later, it would prove to be a crucial element in the safari: a new method of hunting lions. Basically, there are two ways to hunt lions. The simpler way is to mark the direction from where the roars come at daylight. A lion usually stops roaring at this time and settles down for the day in thick cover, especially when he has made a kill. Either on foot or in a hunting car, the hunter then quarters back and forth toward the direction of the last roars, particularly checking the heavy brush. Many a lion has been spotted this way, because he usually sticks his head out of the bush to investigate any strange sound. The surer way is to kill a few antelopes for bait, make a cut in the body cavity to let the fluids drain out, then drag the bait behind a hunting car for a mile or two through likely areas where lions may pass during their night-time hunting forays, and finally tie the carcass securely to a tree, usually high enough that a lion can eat part of it but not all of it. As long as he can still see and smell part of it, he usually stays there until morning. The idea is that a lion that crosses the drag then follows the scent to the bait. By hanging several baits in areas inhabited by lions, then checking them every morning, a hunter can hunt a lot of country. Many years ago, men used to track lions on horseback, using dogs to follow the trail. British officers in East Africa considered this method quite sporting, but it was prohibited long ago. In the days that followed, Gates shot several antelopes, which the hunters carefully dragged and put up as bait in the classic East African fashion, including one magnificent gemsbok with horns as long as Gates’s rifle. He kept the horns and cape. The hunters heard more roaring each night, carefully checked the baits each morning, and spent the rest of each day hunting the surrounding terrain. For some reason, these big Korannaland lions wouldn't touch their baits. Blacklaws was puzzled. So was Gates. They knew that the lions were in the area, because of their nightly roaring, and they found their tremendous tracks in several places. Perhaps they just weren't interested in carrion, although lions in all other parts of Africa eat it with gusto. But only the smaller scavengers like jackals, vultures, and occasional hyenas worked on the baits. It was extremely frustrating to hunt for lions day after day without a glimpse of one, yet continue to hear them roar every night. Finally, on the way back to camp one muggy evening, with the late sun at their backs and the clumps of mopani throwing long shadows ahead, Gates, Blacklaws, and Mbui skirted a kopje of crumbling rock and saw a magnificent black-maned lion not forty yards away. “My God! ?Blacklaws breathed. “Look at that!? In the same instant, Gates slipped the rifle off his shoulder. But before he could raise it, the great lion saw the men, made two tremendous leaps, and disappeared into heavy brush. He hadn't stood there five seconds after the men had seen him, but the picture was indelibly impressed on Gates’s mind. Nothing else in Africa equals the sight of a wild, full-maned lion in all his savage splendor. Majestically he had stood, his flowing tawny-black mane edging to red on the sides and hanging coal-black down his front. Beyond the power and the grandeur and the danger of a lion, it is his mane that is the trophy, the motif, the symbol, the very epitome of Africa, and this one had it all. Both Gates and Blacklaws knew that it would have been foolhardy to go into the heavy brush after this monster in the shadowy dusk. But he was the kind of lion that hunters dream about, and Gates knew that he would never leave this corner of Africa until he had bagged one of these giant lions. At camp, while Mbui roasted tender strips of gemsbok backstrap over the fire, Gates and Blacklaws marked the occasion with an extra drink and a cigar. There is nothing like the sight of a desired trophy and the fresh memory of it to stimulate and revive a hunter's flagging hopes. As the dusky twilight settled in, and the first lion roared, Gates got to thinking how good it would be to go out into the fading light somewhere and call in one of these lions. They often go to another's call, looking for food or a fight. Blacklaws could imitate the roar perfectly, and Gates could do it almost as well, but it took tremendous lung power, and the human voice can't produce the timbre or volume of a lion’s roar. “Has anyone tried to call lions by using an amplified recording of a roar? ?Gates asked. “It has been tried but with rather poor results. If you could get a wild lion to roar naturally into a microphone, then play it back through the proper high-fidelity equipment, it might work.? The elusive half-formed idea that Gates had been chasing around in his mind, ever since Blacklaws had startled Mbui by imitating a roar, suddenly came into sharp focus. “Where is the siphon hose and that big funnel you use to pour gas into the Land Rover? ?he asked. Mystified, Blacklaws brought them from the back of the car. Gates quickly explained, “There used to be a radio character named Bob Burns, who used a thing he called a bazooka. It was a funnel with a piece of gas pipe stuck onto the small end, and he made funny music with it. The important thing is that it increased his volume, something like the principle of a megaphone.? Blacklaws caught on fast. Gates slipped the hose onto the funnel and handed it to him. 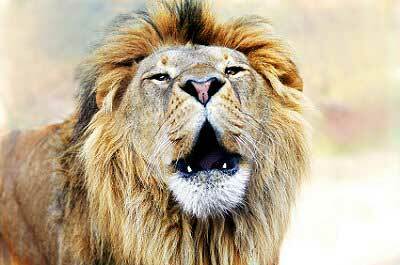 His second attempt was a good rendition of a lion roar with a considerable increase in volume. But it still wasn't quite right. “Wait a minute,?Gates said, remembering something else. “We need a sound box, the thing that gives a guitar volume. I've seen old-timers put violin strings on a broomstick, then put it in a bucket and make music. ?nbsp; Looking around, he spotted an empty five-gallon petrol tin, the square kind with thin sides. He cut the top out of it with a knife, then Blacklaws lowered the funnel into the tin and roared into the hose. Mbui let out an involuntary yelp, and Gates felt the hackles instinctively rising on the back of his neck. It was perfect ?and loud enough to be heard for five miles. Blacklaws was stunned. “A bloody two-shilling funnel and an empty petrol tin. If I'd only known this ten years ago!? “Let's drive out from camp a ways and try it right now,?Gates said, with a wave of excitement sweeping through him. They drove about two miles through the bush to an open clearing that they had spotted a few days earlier. Blacklaws switched the lights off, and the hunters sat there in the inky darkness for a few minutes, whispering. It was a perfect lion roar, and Gates’s hackles rose again. They waited silently for about three minutes, and an answering roar came from far in the distance. “I'll be bloody damned if it isn't working! ?Blacklaws whispered. He waited the proper interval and roared again. A few minutes later, the lion answered again, closer this time. Suddenly, Gates realized that in their excitement, they hadn't brought their rifles. But the important thing was that if this way of calling lions worked once, it would work again. Blacklaws roared a third time. Gates estimated that the answering roar came from less than half a mile away. They waited, and Blacklaws roared again. This time, there was no answer after five minutes. Well, Gates thought, at this close range, the lion had realized that our roar was a fake and wouldn't come any closer. Suddenly, in the stillness, Gates detected a slight sound ahead. Impulsively, he reached over and switched on the lights. Not thirty feet in front of the Land Rover stood a monstrous black-maned lion, looking directly at them. As the light struck, he growled horribly, showing his fangs, and crouched down, lashing his tail from side to side. For what seemed like an eternity, Gates sat transfixed. The top and windshield were off the Land Rover, and if this big lion leaped, the men wouldn't have a chance. Blacklaws eased into the front seat and reached for the ignition key. A couple of times in the past, Gates remembered, the sound of an engine had frightened off a menacing lion ?but would it work this time? The instant before a lion charges, his tail stops lashing and becomes as straight and rigid as an iron bar. Later, Gates realized that his whole attention had been concentrated on the lion’s whipping tail. Sitting there without a rifle in front of that snarling monster gave him the most helpless feeling that he’d ever had. There was no use trying to leave the Land Rover and run. He would have been on anyone fleeing in a single leap. If anyone tried to crawl under the dashboard ?which crossed Gates’s mind ?the lion could pluck him out with one swipe of a taloned paw. As the starter whirred, and the engine fired, the strange sound startled the lion for a moment, but he held his ground and growled again. Blacklaws eased the gear shift into reverse and slowly, almost imperceptibly eased backward, gradually widening the distance. At about seventy-five feet, Blacklaws cramped the wheels hard to the right, whipped the gear shift into low, and stomped the gas pedal. Blacklaws didn't slow the Land Rover until they had gone a mile. Back at camp, they steadied themselves with a stiff drink and discussed their new method of hunting lions. It offered all kinds of interesting possibilities, but neither man suggested going out again right away. They had been driven ignominiously from the field of battle ?enough for one night. At mid-morning, they drove about fifteen miles out into the barren wastes of the Kalahari to practice with the lion caller. After two hours' work, with a few minor improvements, both men had the technique honed to a fine art. “By the way,?Gates said, as they were driving back to camp, “what will happen in Nairobi when you tell some of your professional hunting buddies about this lion-calling trick?? “I'm not telling anybody anything,?Blacklaws said firmly, “and I hope you won't, either.? Every white hunter had a few private corners where certain trophies were easier to come by, and a few hunting tricks of his own that he zealously guarded and kept secret, so Gates promised to say nothing. The sun was hanging on the horizon that evening when they parked the Land Rover. Blacklaws carried the lion caller and his .470 Westley Richards double rifle. Gates carried his .300 Weatherby Magnum, binoculars, and a five-cell flashlight. They walked about five hundred yards to their chosen spot, found a small clump of miombo, and settled down. The air was warm and still. As the soft afterglow of sunset began to fade, Blacklaws got ready. The roar was so real, Gates could feel the same old feelings crawling through his insides. They waited five minutes. No answer. Then Blacklaws roared again. This time, an answer came from not more than a mile away. Gates had already put a cartridge in the chamber, and now he eased the safety off. At the right interval, Blacklaws roared again. The answer came blasting back from somewhere to their left. What they didn't realize at the moment was that this lion was coming to them in a half circle, approaching the quarter with the heaviest cover, which was at their back. Blacklaws hesitated as if in doubt, then roared again. Then he lifted the funnel out of the tin, laid it down silently, and picked up his .470 double. There was no answering roar, but both men knew that the lion was close by. There was still enough light to see about fifty yards. Both men were straining to see in the direction of the last roar when a very faint rustle of grass whispered to their right. 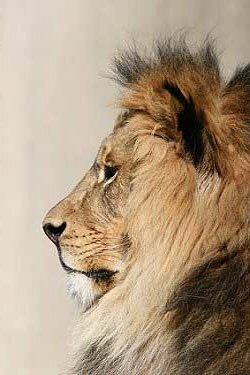 Gates turned quickly and saw a great lion crouched low to the ground, coming directly toward them, stalking like a cat after a mouse. The distance was about fifty feet. 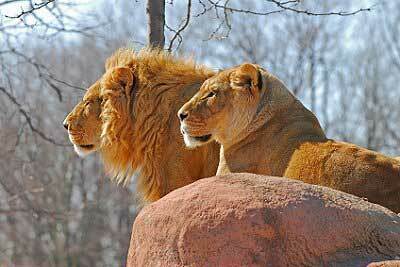 He had come looking for another lion, to share a kill with or to fight, but instead had found two victims to stalk. He meant business, and there wasn't the slightest doubt that when he got a little closer, or if either man made a sudden movement, he would be on them in a leaping rush. Stealthily, Gates swung his rifle around, and Blacklaws raised his double at the same time. The creeping lion had closed the gap to about thirty-five feet, and the men had only a few seconds left. Gates caught his big head in the scope and fired just as he gathered himself to spring. Momentarily blinded by the muzzle flash, Gates bolted another cartridge into the chamber and kept the rifle at his shoulder. “You got him,?Blacklaws said, slowly lowering his rifle. They approached cautiously and stood over the biggest lion that either man had ever seen. The bullet had been high, just skimming the top of his head, but it had entered his neck and severed the spine ?an instant kill. “A bit sticky, that,?Blacklaws said, thumbing his safety on. “For a second or two, I thought you couldn't find him in that bloody scope. I'd already taken the slack out of my trigger when you shot.? He went back for the Land Rover while Gates sat admiring his trophy and sweeping the flashlight around every minute or so to make sure that no more lions were nearby. The big lion was too heavy for them to lift into the car, so they spent two hours skinning him on the spot, leaving the head intact to work on later at camp. Mbui came out of the boma as they drove up, but when he saw the great maned head staring at him, he backed away terrified and wouldn't touch the skin. Gates and Blacklaws worked until midnight to complete the skinning, carefully treating the trophy with salt to keep the hair from slipping. Then they drank a few toasts to celebrate, smoked fine cigars, and described all the details of the hunt to each other again. As Gates lay down at last, an exhausted but happy hunter, a final roar came floating in out of the night. There may be some who wouldn't believe their story of these monster lions if they could only describe their roars, but at last they had physical proof that the giant black-maned lions of Korannaland were neither myths nor extinct. And they'd devised a new method of hunting lions. Copyright ?2008 Dr Kenneth E Howell. All Rights Reserved.